The Canadian oil and gas company has come a long way in just a few short years. Encana (NYSE:ECA) has undergone a remarkable transformation over the past three years. It went from a relatively deeply indebted natural gas company to a streamlined and focused oil growth company. The following three charts show the company's impressive progress. In November 2013 Encana announced a new vision and strategy to transform itself into a leading North American resource-play company. That strategy includes focusing its capital investment on the best oil and liquids-rich resource plays to grow margins. As the chart below shows, the company has quickly gone from a natural gas producer to a more balanced producer. Data source: Encana Corp. Chart by author. Three drivers fueled this shift: Encana monetized low-margin gas assets, acquired liquids-rich growth assets, and focused capital expenditures on drilling in liquids-rich plays. The company got the ball rolling in early 2014 by announcing a string of asset sales, including selling its Jonah Field in Wyoming and East Texas gas properties for $1.8 billion and $530 million, respectively. The company took that cash and immediately reinvested it to acquire assets in the oil-rich Eagle Ford shale from global resources giant Freeport-McMoRan (NYSE:FCX). Under the terms of that deal, Encana paid Freeport-McMoRan $3.1 billion in a transaction that not only doubled its oil output at the time but provided it with a platform for significant future growth. The company would go on to complete several more noncore asset sales throughout the year, putting it in the position to acquire Athlon Energy for $7.1 billion -- an investment that provided it with a premier oil position in the Permian Basin. Data source: Encana Corp. Chart by author. In millions of dollars. Consequently, the company has a focused core, centered on its prime positions in the oil-rich Permian Basin and Eagle Ford shale. Despite spending more than $10 billion on acquisitions over the past couple of years, Encana has actually reduced its total debt. 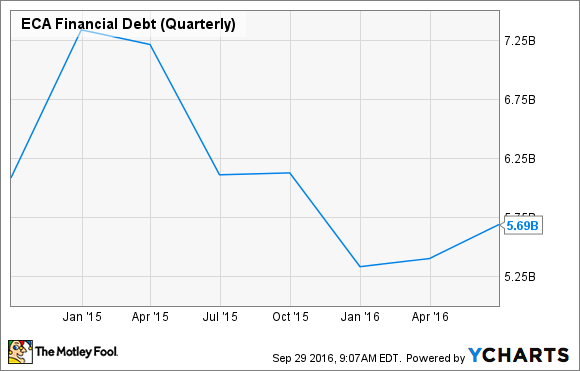 ECA Financial Debt (Quarterly) data by YCharts. Three factors are driving this decline. First, Encana has continued to sell noncore assets. Second, it issued more than $1 billion of equity in early 2015 to pay down debt. Finally, it took advantage of market conditions earlier this year and completed a tender offer to repurchase debt at a discount. In that transaction, it repurchased $489 million of senior notes for just $400 million. Overall, debt is down roughly $2 billion since the end of 2014. In addition, the company recently announced another equity offering and closed additional asset sales, which combined should bring in an additional $2 billion in cash to further improve its balance sheet. Encana undertook bold actions to transform itself into a streamlined company with oil-rich growth opportunities. Those efforts are clearly paying off as the company's production shifts toward liquids as a result of a major reshuffling of its portfolio. What's just as impressive is that Encana has been able to accomplish this amid one of the worst downturns in decades, all while improving its balance sheet. It is a transformation that sets the company up for a bright future as industry conditions begin to normalize.